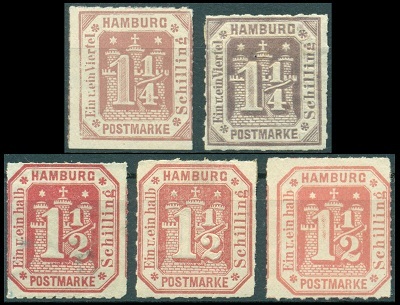 The two German states stamps for the Free City of Hamburg, issued during the first half of 1866 were a complete departure from the manufacturing characteristics of all their earlier postage stamp issues. The new 1 ¼ Schilling denomination stamp was issued on June 27, 1866, and the new 1 ½ Schilling denomination stamp was issued on April 4, 1866. Authenticated blocks of them are shown above. 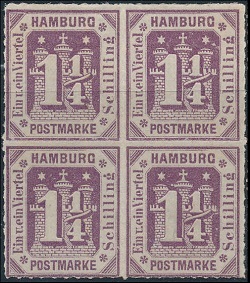 These new German states stamps for the Free City of Hamburg were embossed on unwatermarked paper, and they were rouletted 10 x 10. The catalog attributes are as follows. 01 ¼ Sch. (Mi. #20, Sc. #24) - Violet, Red Violet. 01 ½ Sch. (Mi. #21, Sc. #25) - Rose. For a set of stamps that is relatively inexpensive, at least in mint condition, determining whether examples are originals or reprints can be extremely problematic. The table below will explain the characteristics of the reprints and originals for the two denominations. Rule of thumb ..... if a stamp EXHIBITS ANY OF THE FOLLOWING REPRINT CHARACTERISTICS, then it is a REPRINT. If a stamp DOES NOT EXHIBIT ANY OF THE FOLLOWING REPRINT CHARACTERISTICS, then it is probably an ORIGINAL. (Both Stamps) If the center circle of any of the four rosettes is closed (filled-in), then it is a reprint. If ALL FOUR rosettes are open in the middle, then it might be an original. (1 ¼ Sch.) If the large numeral "1" is shaded, then it is a reprint. If the numeral is unshaded, then it might be an original. (1 ½ Sch.) If the frame line of the vignette above the letter "P" of "POSTMARKE" is broken, then it is a reprint. The line is complete on the originals. (Both Stamps) If the line from the ornament to the top of the "G" of "SCHILLING" to the top of the letter penetrates into the top of the letter "G", then it is a reprint (see the graphic below). The line does not penetrate the top of the letter "G" on the originals. (1 ¼ Sch. #1) - The rosettes are actually clear in the middle, BUT the large numeral "1" is shaded. (1 ¼ Sch. #2) - All but one of the rosettes are filled-in in the middle, the line from the ornament above the "G" protrudes all the way through the top of the letter "G", AND the large numeral "1" is shaded. (1 ½ Sch. #1) - All but one of the rosettes are clear in the middle, AND the ornament line does not protrude into the top of the letter "G", BUT the frame line above the "P" of "POSTMARKE" is broken. (1 ½ Sch. #2) - All of the rosettes are clear in the middle, BUT the line from the ornament protrudes all the way through the top of the letter "G", AND the frame line above the "P" of "POSTMARKE" is broken. (1 ½ Sch. #3) - All of the rosettes are clear in the middle, AND the line from the ornament does not protrude through the top of the letter "G", BUT the frame line above the "P" of "POSTMARKE" is broken. There are some shading lines in the large numeral "1" as well. 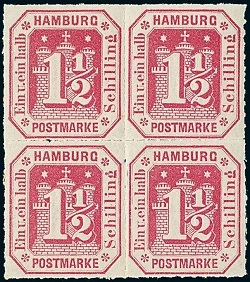 The final German states stamp for the Free City of Hamburg was issued on May 5, 1867. The new 2 ½ Sch. denomination stamp features the 1859 frame design instead of the 1864 frame design used for the former 2 ½ Sch. denomination stamp. There were two printings which are both shown above. These new stamps were typographed on serpentine watermarked paper, and they are perforated 13 ½. First Printing (Mi. #22a, Sc. #26) - Dull Green. Second Printing (Mi. #22b, Sc. #26a) - Dark Green. These 2 ½ Sch. stamps also exist imperforate and as horizontal and vertical pairs, imperforate between the stamps. They are scarce, as such, but the prices in the Michel catalog are quite reasonable. On January 1, 1868, the postage stamps of the Free City of Hamburg were replaced by those of the North German Confederation. For additional specialized research .... The Postage Stamps of Hamburg, Bremen, Lubeck and Bergedorf by Dr. Georges Brunel is available on CD through Amazon.com. The highlights of this book include enlarged drawings and detailed descriptions of the varieties and marks found only on the genuine stamps. There are chapters on the reprints and forgeries of the stamps of each state, explaining how they can be distinguished from the genuine stamps. Around 100 illustrations. 41 pages.